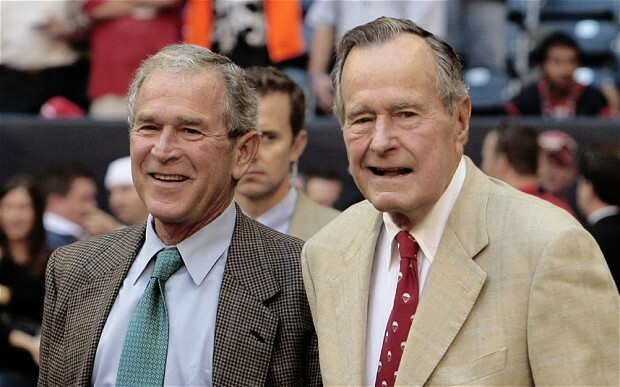 Americans have been looking back on the two Bushes in absurdly glowing terms — the younger George since his grandiose speech on democracy (in which he blasted Donald Trump), and the elder since he died last week. I’m not generally one to take someone down in the wake of his demise, but I do make exceptions, not least when it comes to revisionist affection for very bad leaders. Jimmy Carter was the best (and only good) president in my lifetime and the Bushes were the worst. I explained my scoring in detail here, but I repaste the explanations for the two Bushes below, since they are apparently needed in our age of alternative facts and absurdist revisionism. Liberty (7/20): To Bush’s credit, he signed the Americans with Disabilities Act, and had commendable views on immigration. But his sins outweigh these causes. He pardoned high-ranking officials who were involved in Reagan’s Iran-Contra scandal. He escalated the war on drugs, demanding more prisons and jails and prosecutors, while of course maintaining the legal disparities that made African Americans ten times as likely to be incarcerated. He did nothing to help against the spread of AIDS, regarding it mostly as a contemptible issue. And on his watch the FBI covered up federal misconduct when residents were shot at the Ruby Ridge property in Idaho: the FBI snipers had been given illegal shoot-to-kill orders; the residents were acquitted of all crimes; and yet one of the shooters was promoted to the #2 job in the FBI hierarchy. A total score of 12/60 isn’t the record of a good president by a long shot. Just because you can watch an old video clip that shows George H.W. making favorable remarks about immigrants, and contrast that with an overt racist like Donald Trump, doesn’t mean the former deserves to be lamented. Seriously. Peace (0/20): The younger Bush was an atrocious president in every way, and in my opinion the second worst in U.S. history after Woodrow Wilson. He invaded Iraq for no legitimate reason at all, and bogged America down in a new Vietnam. Scholars are in wide agreement that the Iraq War was one of the hugest foreign policy disasters in U.S. history. Not only was it a distraction from the critical task of focusing on the 9/11 attackers, it was based purely on Bush’s need to settle old scores with Saddam, and justified by manufactured evidence. He demanded that his advisors come up with proof that Saddam and al Qaeda were linked in cause, and that Saddam had weapons of mass destruction — neither of which was remotely true — and when they couldn’t, he sent them back to the drawing board, saying “Wrong answer.” The biggest anti-war protests in history broke out across the globe. By removing Saddam, moreover, Bush empowered Islamists and jihadists to fill the power void, who are far worse than Saddam. (In Saddam’s Iraq you were at least mostly safe if you stayed out of politics and played by Saddam’s rules.) Ivan Eland’s indictment of George W. is a zinger: “If Bush had been president when the Japanese attacked Pearl Harbor and Hitler declared war on the U.S., he probably would have gone to war against Argentina instead of Japan or Germany.” He earns an absolute goose-egg in the peace category. Those who conveniently forget why they were so infuriated by the above atrocities should pull their heads out of their asses. George W. was certainly not a “good president compared to Donald Trump”. He was appalling, pure and simple. The lionizing of Bush Sr. seems to me ludicrous. He was the first US President whom I felt was a truly evil, amoral man. Even beyond what you cite above, his militarism was in direct response to “needs” of his own creation from his days at the CIA and as V.P. Even when he was in office, it felt to me like he was getting slapped on the back for mopping up milk he had deliberately spilled… so that he could get slapped on the back for being such a great guy. That the U.S. had no other response to the sudden end of the Cold War other than “better keep the military-industrial complex busy SOMEHOW” is unconscionable. And we are indeed paying the piper, still. Agree completely, Greg. Blog comments are less abundant than they were in the past, so thanks for leaving one!